The Chief of Defense Staff (CDS) , Vice Admiral Ibok Else Ibas was in Maiduguri on Saturday along with other service chiefs, the Chief Naval Staff, the Chief Air Staff, defence, air force and Army chief of training and operations following recent boko haram attacks in Borno and Yobe states before and after christmas. The CDS who held about 4 hours close door meeting with the commanders and commandants of operation lafiya dole at the theater command headquarters Maimalari Cantonment Maiduguri to access operations of the military at the theater deliberated extensively on the military general operations in the north east. General Gabriel Olanisakin after the close door meeting which lasted upto 4.47 pm from about 12.45 pm with the service Chiefs, Principal officers of the defense, army and navy, the Theater Commander, GOCs and other brigade commanders in the operation lafiya dole theater command , he commended the officers and troops for their doggedness, bravery and gallantry in countering the activities of the boko haram insurgents and other criminals in Buni Yadi, Monguno and Baga, neutered the commitment of the Nigerian military in rooting out boko haram insurgency in the north east and country at large. 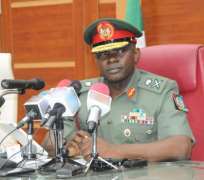 The Director Army Public Relations Headquarters, Brigadier General Sani Kukasheka Usman who addressed newsmen immediately after Tuesday meeting said, the CDS has after receiving all the briefs, urged them to keep the tempo and improve in restrategizing their operations. He also assured them of government's full support and motivation to end the fight while pledging to continue to support the the counter insurgency operations to its logical conclusion. The CDS further advised them to redouble their efforts towards enhancing their operations in the fight against the boko haram insurgency. He added that the military will however give out more updates on the operations of the military in the theater command as details unfold while appreciating the role of the media in the counter insurgency operations.